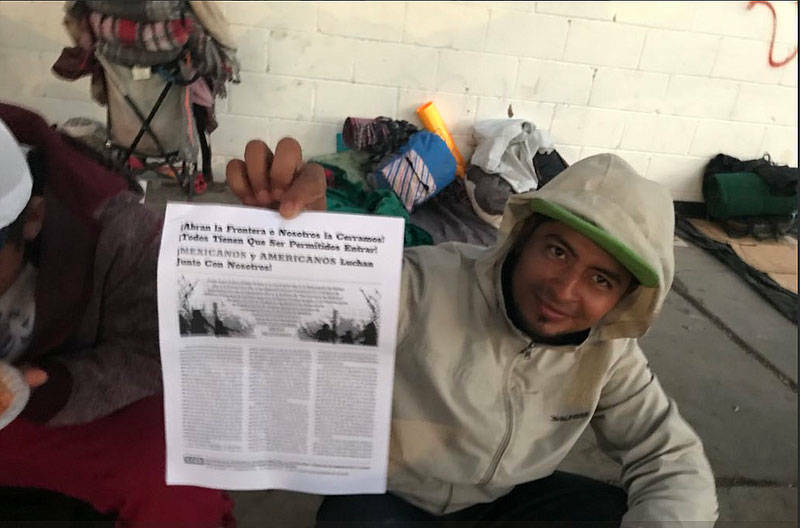 The flyers spread across the migrant camps in Tijuana. 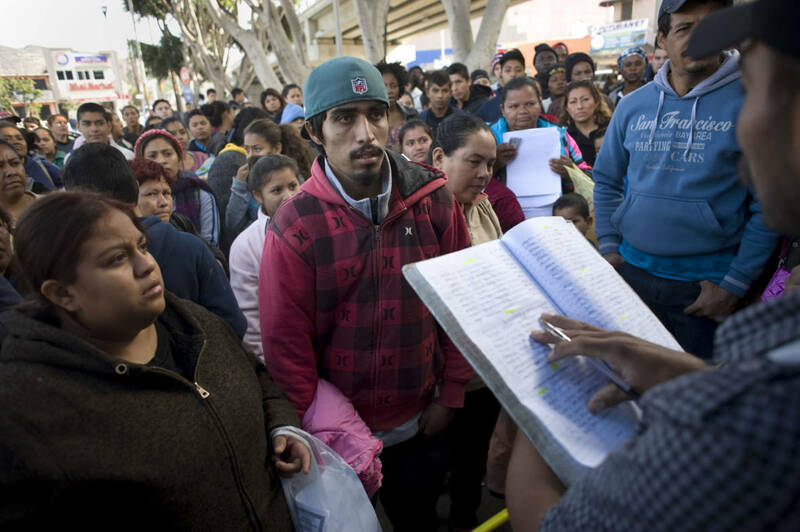 Some Central Americans squinted at the papers as if they were love letters they didn’t believe. “Open the border or we’ll shut it down! All of us must be allowed to enter!” the notes read in Spanish. The handouts, made in the United States, informed migrants of their legal right to seek asylum regardless of how they enter the U.S. Some featured illustrations of silhouetted families tearing down a chain-link fence. The flyers were written in the first-person plural, as if by the migrants themselves. But they were, in fact, authored by By Any Means Necessary (BAMN), a U.S.-based group. The 64-year-old attorney and civil rights organizer said many migrants are not safe in Mexico. Tijuana is seeing record homicides. Two migrant teenagers were killed in December while waiting to enter the U.S. BAMN has two to six “loosely organized” volunteers in Tijuana who have handed out hundreds of flyers, Driver said. KPBS asked Driver about the two recent incidents in which U.S. authorities launched tear gas into Mexico because people, including women and children, were approaching the border en masse, some in response to BAMN flyers. Karen Perez, 32, is a Nicaraguan who traveled with the caravan and her four children. She doesn’t like the idea of getting tear-gassed. “If you tell me to cross illegally, then you’re putting my life in danger, and my kids’ lives as well,” she said. In her tent at Barretal, Tijuana’s main shelter for the migrant caravan, she kept her chin up and tried not to smear her coral red lipstick as she wiped tears from her face. Talking about the uncertain future made her as emotional as the violent past. Perez said the conflicting messages about the U.S. asylum process have been confusing. She was first told to put her name on a weeks-long wait list so she could apply to enter through the San Ysidro Port of Entry. That’s what she did. Now, some Americans are telling her to skip the line. Is BAMN Putting Migrants in Danger? 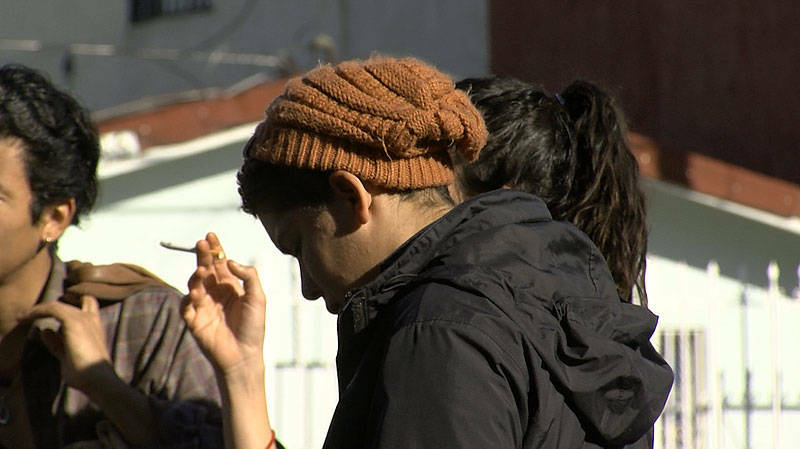 Migrant advocates with Al Otro Lado, a migrant advocacy group that provides pro bono legal services in Tijuana, said BAMN is putting migrants’ lives in danger. 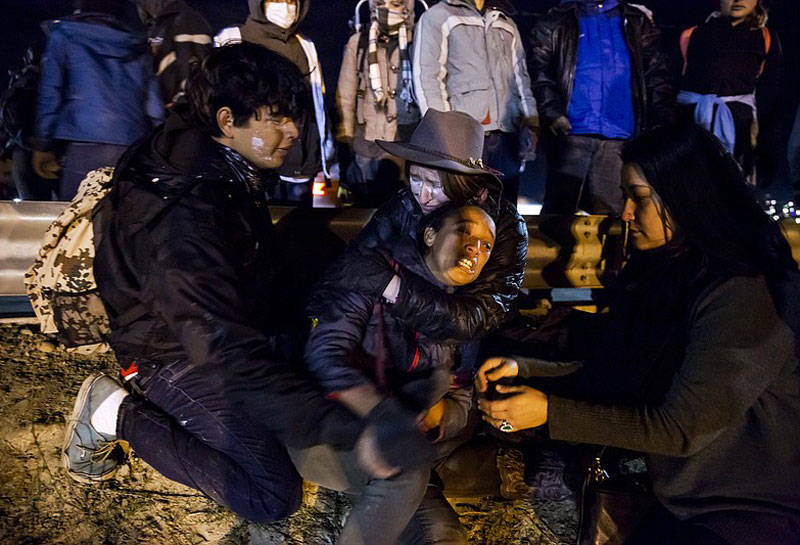 “Waiting in Tijuana is not the same as trying to cross a smuggling route that is controlled by organized crime,” said attorney Erika Pinheiro, who added that some of her clients have been kidnapped and killed after crossing the border illegally and getting caught in smuggling routes. Pinheiro said the photos and videos of migrants storming the border feed Trump’s narrative that they’re invaders. She said BAMN is using the migrants to convey a message to President Donald Trump, and that it is backfiring. “That is not solidarity. That’s exploitation. They’re exploiting migrants to make a political point about who should and shouldn’t be allowed into the United States,” she said. "They're feeding into the narrative that anybody who tries to help migrants is also criminal, and it's really doing a lot to harm our movement." As a precaution, she said, Al Otro Lado has changed its volunteer policy to prohibit anyone who works with the organization from encouraging migrants to cross the border illegally. Some left-wing American activists under a collective they call the "Caravan Support Network" say they’re taking a more moderate approach with the migrants, bringing food and donations and protecting them from hate groups. Evan Duke III stood 6’3” and towered above most of the Mexican police officers stationed at a migrant shelter in Tijuana called Contra Viento y Mareo on a recent Monday. Duke, a 48-year-old anti-fascist organizer from Seattle, had previously faced down white supremacists and misogynists at protests by violent far-right groups like Proud Boys, Patriot Prayer and Unite the Right in the U.S. Guarding the warehouse, the Americans were conspicuous in their eclectic style. A wiry blonde man in white gloves watched police with blue eyes behind thick-rimmed glasses. A woman wore cowboy boots over knee-high socks, and a man with long, blonde hair wore a sarape. A pile of backpacks and a tote bag lay beside a tree. Duke, in a scarf and sunglasses, smoked a cigarette and spoke on the phone, trying to decide if he wanted to follow through with a scheduled interview with KPBS. Duke’s record includes several guilty verdicts in the state of Washington for crimes ranging from DUIs to harassment, none more recent than 2012. Duke said he went through a period where he “struggled with an alcohol problem and was very reckless.” But those things are in his past, he said. He has since gotten into environmental and indigenous rights activism, including the Dakota Access Pipeline protests. One woman told the group not to speak to us, citing a story that we published with testimony from a journalist who said he saw some of the Caravan Support Network activists helping migrants get over the border fence on New Year’s Day, after U.S. authorities fired tear gas into Mexico. A few days later, Duke changed his mind. He met us by the border in Playas de Tijuana. Duke explained why the activists came to Tijuana in the first place. He said the Caravan Support Network started operating in Tijuana on Nov. 25, the day of the first tear-gas incident at the border, to provide food and other relief to migrants. Additionally, they wanted to protect the Central Americans from anti-migrant groups that were beginning to organize marches against them. “When right-wing hate groups threaten to march on refugees, we’re going to put a call out to the community to stand in support of them … to put bodies in front of them if they’re threatened,” Duke said. On Dec. 4, the far-right group Oath Keepers put out a call to action for militants to head to the border to “help stem the tide of illegal invasion.” The group did not respond to repeated requests for comment about those plans. He said his group’s initiative to help the caravan is part of a larger plan: the “Border Support Network,” to set up camps on indigenous land along the entire U.S.-Mexico border, to try to stop President Trump’s wall construction and other projects. They plan to launch this effort at the Somi Se’k Village Base Camp, where, with the help of the local tribe, they will educate activists in flora and fauna conservation, indigenous ways of life and nonviolent direct action such as tree sits and sleeping dragons. He said he believes in the Amazonian prophecy of the eagle and the condor, which says that two divided paths, represented by the birds of prey, will soon reunite. “I advocate for an end to borders … that’s just me personally,” he said, emphasizing that not everyone in the Border Support Network has the same beliefs. When asked about the New Year’s incident, Duke said he wasn’t there. But his friend Brendon Tucker, a 24-year-old Texan, was there and wanted to correct the record about that night. He denied allegations that activists had done anything illegal. He said they ran into the migrants as they approached the fence of their own volition, and that the Americans stopped to document human rights abuses and to offer medical aid. Someone in their group had milk of magnesia, to counter tear gas effects. Tucker said he wanted to help migrants after learning that the U.S. contributed to unrest in Central America, such as by backing military coups, sending guns, and emitting greenhouse gases that hurt harvests. “I believe in cleaning up our own mess, and this is a mess we created in the first place,” he said. Tucker knows how to cook, and after hearing about family separations last summer, he set off to launch a kitchen for migrants south of Brownsville, Texas. When he heard thousands of migrants were going to be stuck in Tijuana while awaiting asylum in the U.S., he traveled west. Tucker, who’s blonde with a Texas Hill Country accent, said he didn’t always feel passionately about this issue. “In Texas, we were taught Manifest Destiny like it was the best thing since sliced bread,” he said. Books are what changed his mind about the superiority of the white race. He rattled off a list of books he said Americans who think of migrants as “criminals” should read: "Manufacturing Consent" by Edward S. Herman and Noam Chomsky and "What Uncle Sam Really Wants," also by Noam Chomsky. Paloma Zuniga, a 41-year-old Mexican-American media personality who goes by “Paloma for Trump,” has become the face of the anti-migrant movement in Tijuana. Zuniga has sold “Make Tijuana Great Again” baseball caps since the arrival of the caravan. She spreads conspiracy theories and xenophobia on Facebook, falsely telling people a photo of a mother running from tear gas was staged. “People say, ‘Donald Trump doesn’t like you, white people don’t like you,’ and that’s not true. Most of my friends are blonde and very American,” she said. Zuniga was 11 when she migrated to the U.S. from Mexico with her mother, who married an American man with two daughters of Polish descent. “I couldn’t get away with not learning English ‘cause (my stepsisters) would pick on me like you wouldn’t believe,” she said. Zuniga said the only discrimination she’s ever faced personally was in elementary school, and it wasn’t from white people, but from U.S.-born Mexicans. She said they would pull her hair and push her because of her accent. “Hispanic people are all very jealous of each other,” she said. At the migrant shelter, Zuniga found a Honduran man she had met before, who had told her he had plans to go home. He told her he needed money to buy bus tickets for his two friends to join him. He wanted to know if he could ask her followers on Facebook to help him; they were going to tell Hondurans to stop organizing caravans. He said he was disillusioned with how hard it was to get into the U.S.
Zuniga was part of a confrontation against the caravan in the fall. Rocks and punches were thrown. She told KPBS she has since realized the migrants are not that bad. Zuniga says she’s not against all the migrants — just the ones who break the law. “Give me your hand so they see,” she tells the Honduran man who was heading back home, gripping his hand while her boyfriend recorded them on Facebook Live. And while thousands of these Central Americans want asylum, Zuniga said most of them don’t deserve it. “They call me a racist all the time. They call me a vendida. They say I’m against my own people … The bottom line is, each country should take care of its own people,” she said.